HONDA has used the CB500 and the CBR name on a plethora of small and mid capacity models models since around 1970. Perhaps the most famous of them all was the giant killing CB500/4. While the current CBR500R and its stable-mates the CB500F and CB500X aren’t as likely to slay as many giants as the ‘Four’ did it’s still likely to sell very well, essentially because it’s a great little bike. A likely trio During the launch we were only able to sample the faired CBR500R, which although it sounds and looks like a sports machine is a lot more comfortable than you would think. We hope to test the ‘X’ soon as it looks to be the dark horse of the trio, and it makes you think which buyers will go for which model. 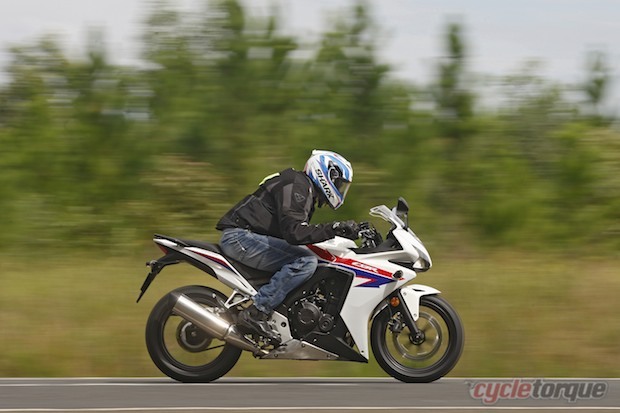 It could go the way of younger people who are style conscious will most likely go for the CBR500R, riders looking for a good all-round bike most likely the CB500F unfaired bike, and adventurous souls the CB500X. With essentially the same running gear and the price differences between each model not substantial, it will come down to which style the rider likes most. We have seen the CB500X fitted with some adventure touring accessories and it looks like being lots of fun, and a capable all roads bike. We expect the CB500F and CBR500R to be bought mostly by learners or commuters, while the CB500X could also have experienced riders looking at it because of its adventurous side. Powering all three bikes is a 471cc parallel twin cylinder engine. The same frame is used throughout as well, and all three machines are built in Honda’s Thailand factory. This basic engine design has been around for a number of years now, but it’s been updated for the release of these new models. It would have been difficult for Honda to financially justify an all-new engine design for a LAMS machine but that said we found the engine to be a gem; flexible and offering a decent amount of horsepower. It has just under 50 horsepower, produced at 8500 rpm (the 500/4 in 1972 had 50hp too), and with the light weight of the bikes it’s a nimble and well balanced overall package. We would expect it to be a tough little engine, because that’s what Honda is renowned for. Honda obviously has confidence in the product too, as service intervals are 24,000 kilometres. No, that’s not a misprint. 17 inch spoked alloy rims are fitted on each bike, taking 120 front and 160 sized rear tyres. This allows a good range of tyre choices, so you can fit anything from real sticky ones to touring tyres which will last ages. You can also go for a road/trail tyre on the ‘X’, but the front guard will limit how ‘trail’ you go there. 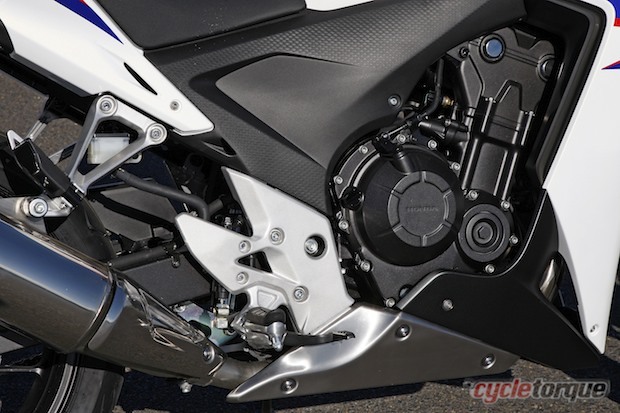 Honda has opted for a single front brake with two-piston calipers on each model, and it gets by rather well with that set up. A twin disc front would be overkill. 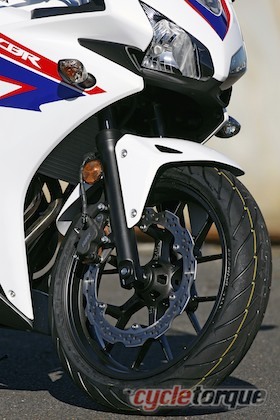 Both the CBR500R and the CB500F share the same suspension specification; 41mm telescopic forks with 108mm of travel, and a 9-stage pre-load adjustable single shock with 118mm of travel. 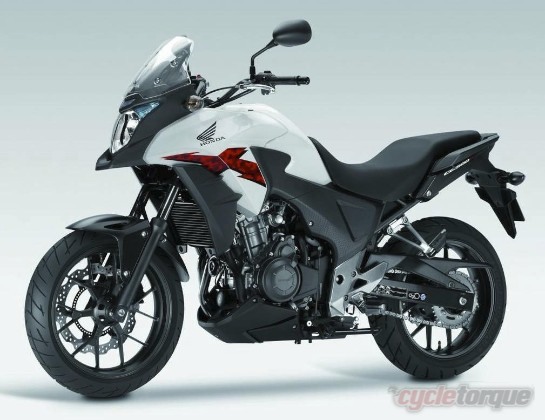 Compare this to the adventure touring styled CB500X which has around 122m of front fork travel. The rear shock on the ‘X’ is the same as the other two models. You can also see the difference in some other areas. Both the ‘R’ and the ‘F’ have a 790mm seat height, and a 15.7 litre fuel tank, while the ‘X’ has 1.5 litres more fuel capacity, and the seat height is 20mm taller. The weight of each bike is very similar, with the ‘R’ 194kg and the ‘X’ only one kilo heavier. Honda says the fuel range of the CBR500R is over 400 kilometres, and as we did a pretty long day on the bike launch we would expect this to be right. That’s a pretty good job by Honda. How many weeks of commuting could you do with that fuel range? Engine is a quite flexible in its power delivery. Even for a rider around six foot tall there’s plenty of room on the CB500R, and the other two models will be even better. We did around 400 kilometres on the launch route in one day, and the only issue with comfort was the seat which did become a little hard after an hour or so on the move. It will be interesting to see how good the seat is on the CB500X when we get the chance to ride it. You would expect owners to travel further afield on that particular bike than the other two, and they expect decent seats. There are options to overcome that. Putting an Airhawk inflatable seat on is just one of those. Even though there weren’t many corners on the launch route it did show us the bike is very easy to live with. There’s enough grunt down low to let you be a little lazy with the gear changes, so cruising along with the traffic is easy. Things get a move on around the 5000rpm mark, and the little engine likes to spin right out to its redline. On one section of swervery we were able to let the CBR500R ‘have its head’, and it was surprisingly easy to take on the bends at a very exciting pace. Not only did the bike swing into and out of bends with ease, it felt planted on the average road surface, and gave a sweet turn of speed. It might be a LAMS bike but it’s lots of fun too. When you look at the retail price for the CB500R you realise it’s a lot of new bike for the money. 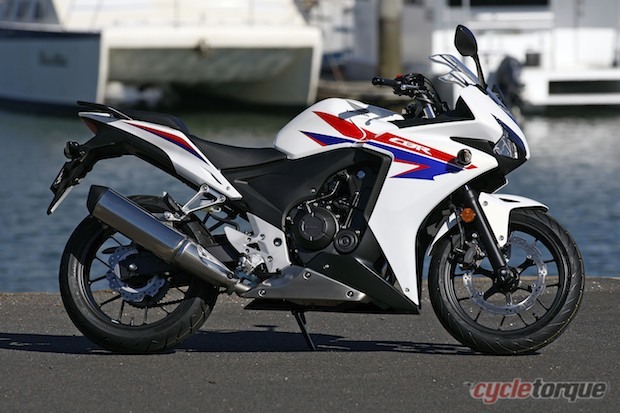 At only $6990 ($7490 for the ABS version), the CBR500R is very well positioned in the marketplace. It has lots of competition from a number of players in the market who offer LAMS machines at similar capacity and price but Honda has a great name and builds great bikes, so we would expect sales to be strong. Take the ‘X’ for example, which according to Hondas has lots of pre-orders. We think Honda has played a bit of an ace card here offering three models from basically one bike.